The KAURI PROJECT was an initiative undertaken by the Royal Botanical Gardens in Sydney. 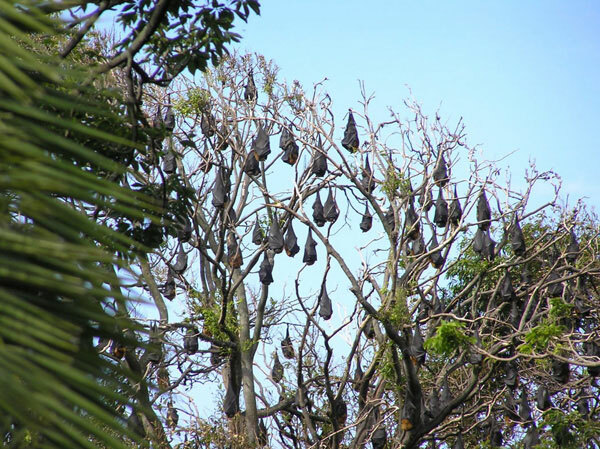 The Botanical Gardens had become underthreat by the grey-headed flying foxes. 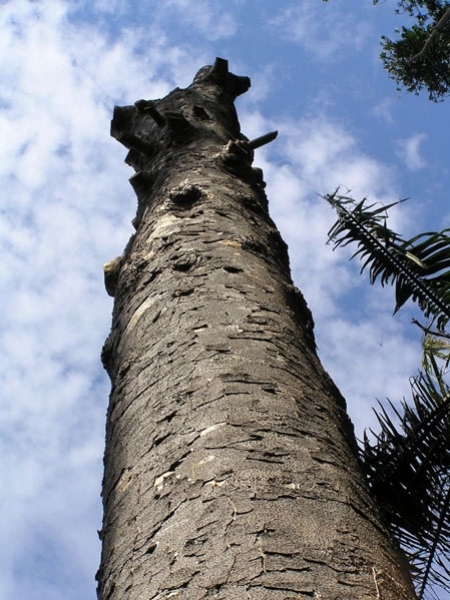 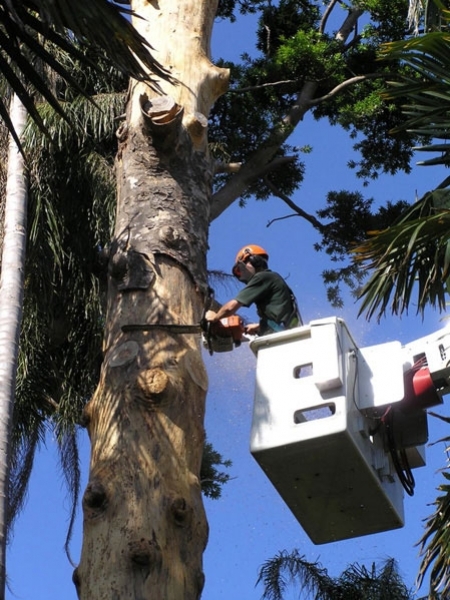 Despite efforts by the gardens staff, the Flying foxes had already killed 26 old growth trees. Amongst these trees was a 160 year old White Kauri ( Agathis moorei ) It was decided to fell the giant tree and raise awareness of the plight of the trees in the Gardens which were now under constant attack. 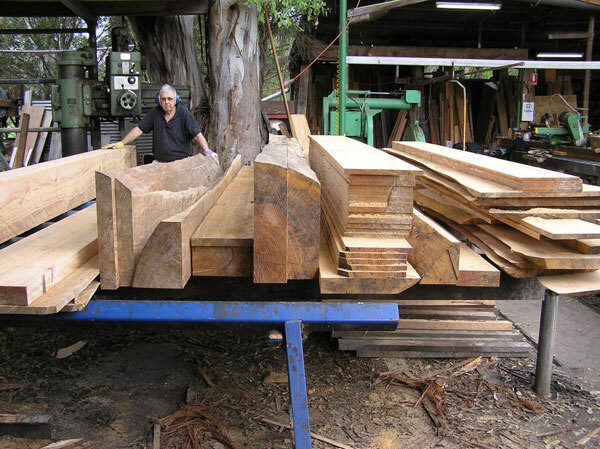 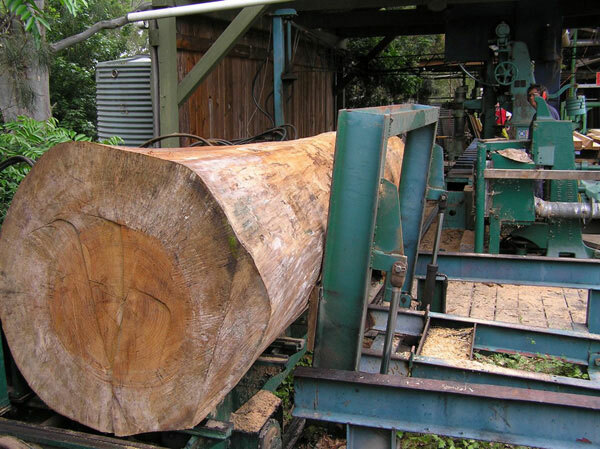 Thirty craftspeople and artisans were approached with the idea of creating numerous items from the felled Kauri. 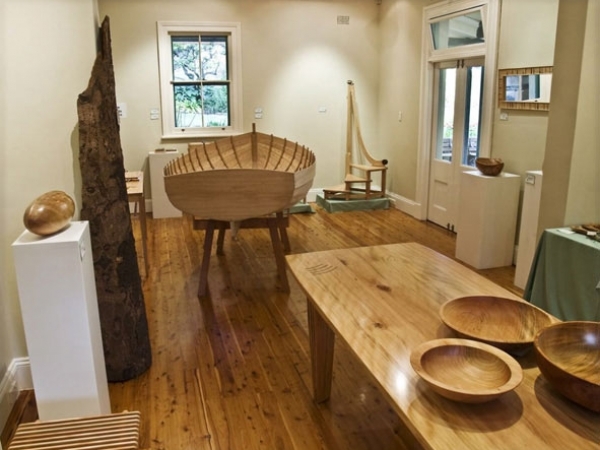 An exhibition was planned to display the crafted items. These were all for sale with a percentage of the profits going directly to the gardens to assist in dealing with the Flying Fox issue. 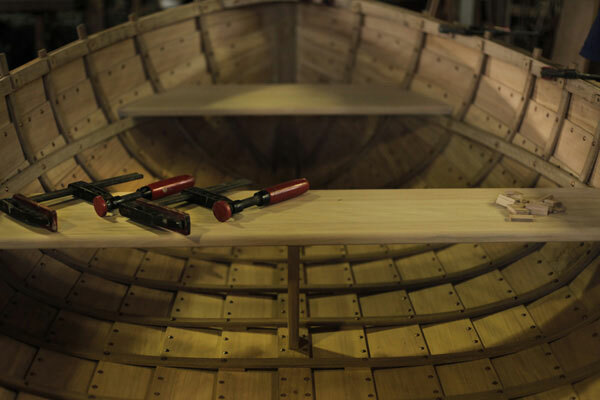 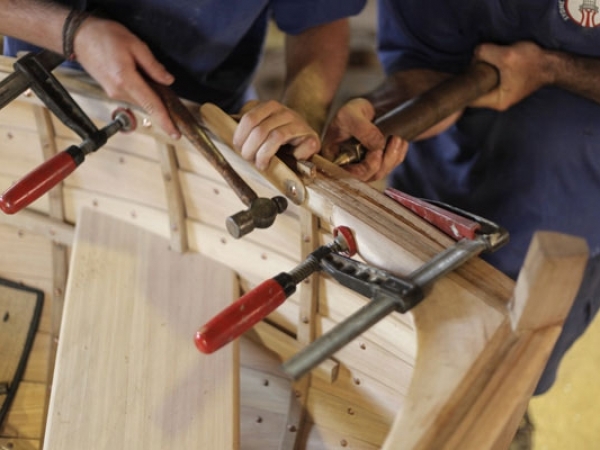 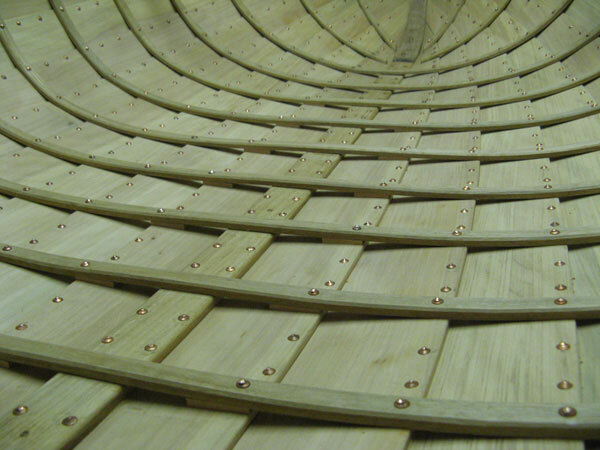 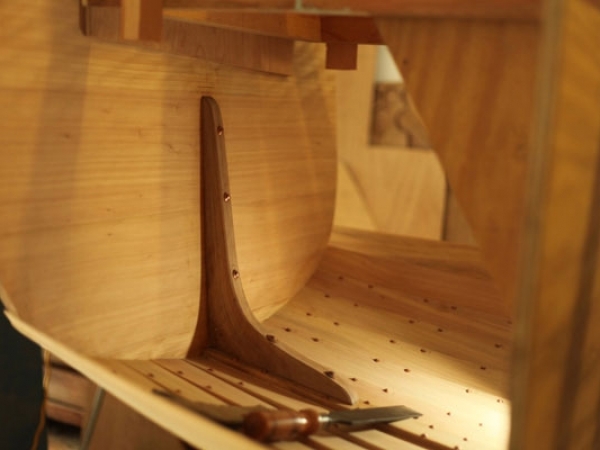 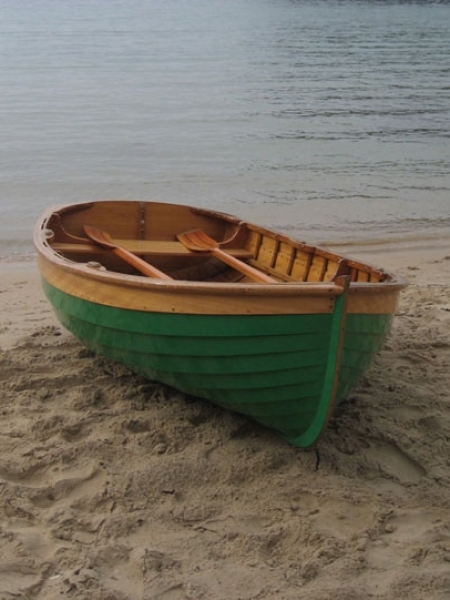 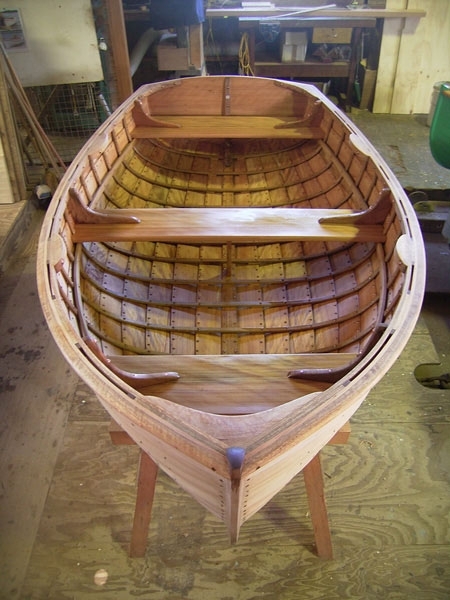 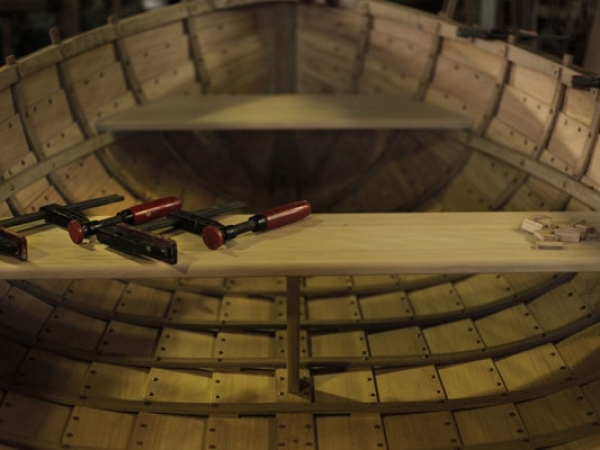 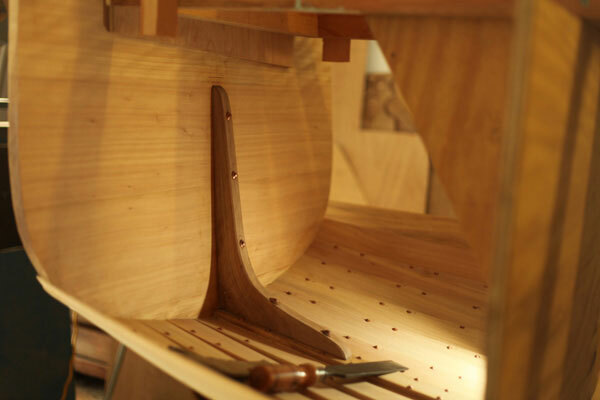 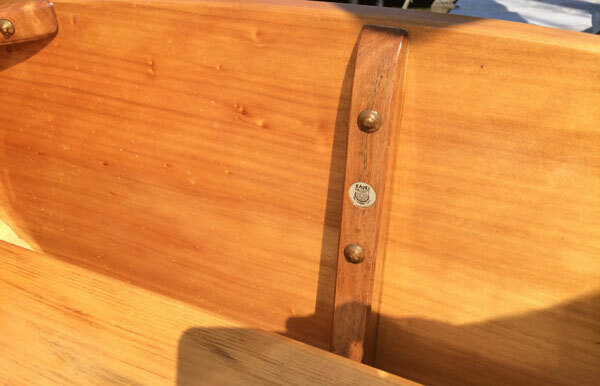 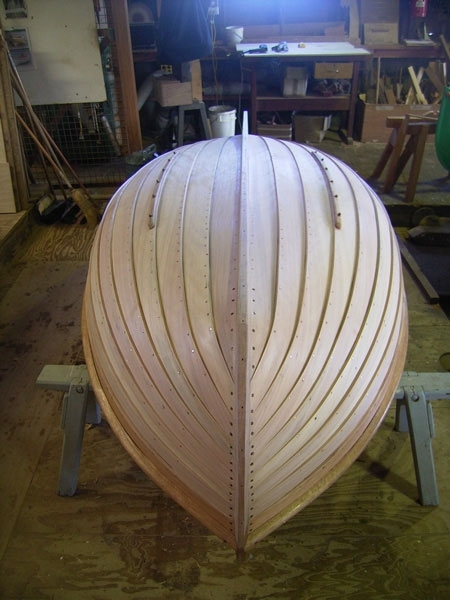 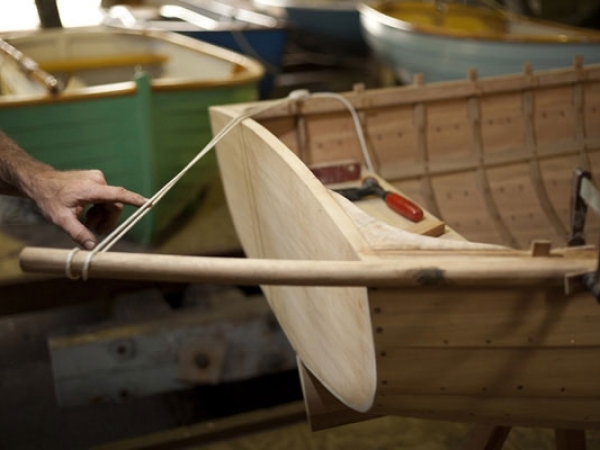 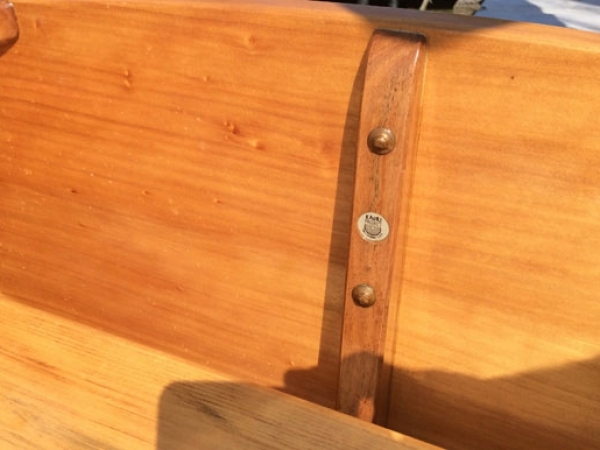 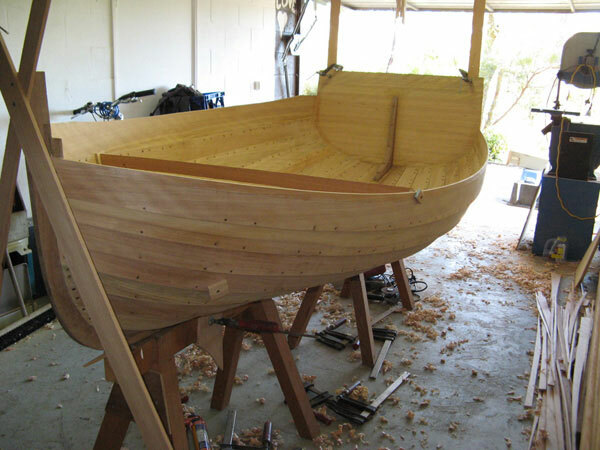 Simon Sadubin was approached to build a clinker dinghy. 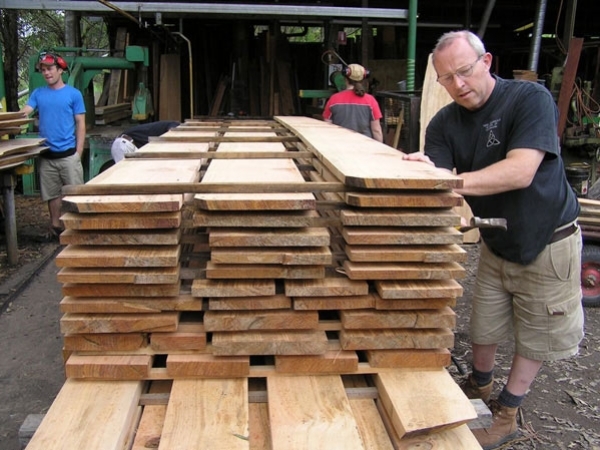 A cutting list had to be drawn up and the material was expertly sawn by Richard parsons at his specialist timber yard Canalpie Timbers in North Richmond. 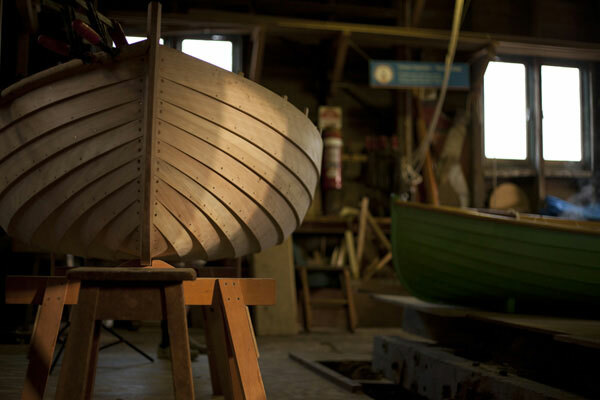 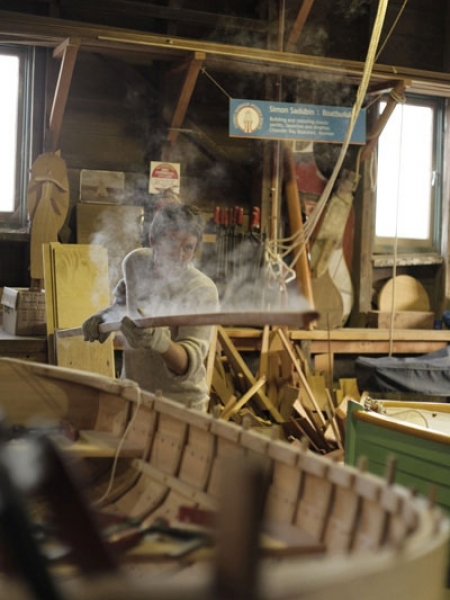 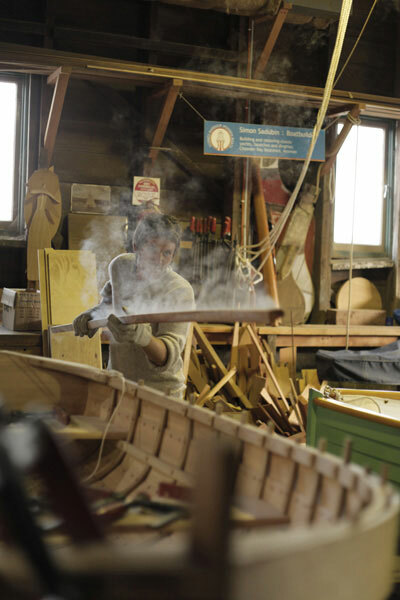 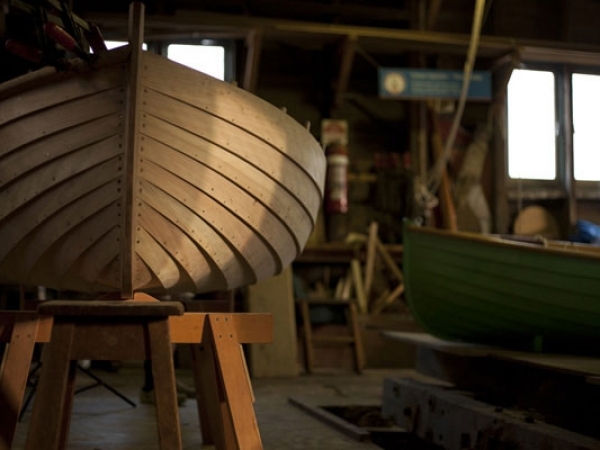 The material was transported to Sydney Wooden Boats Boatshed and stacked out to air dry slowly over the next 12 months. 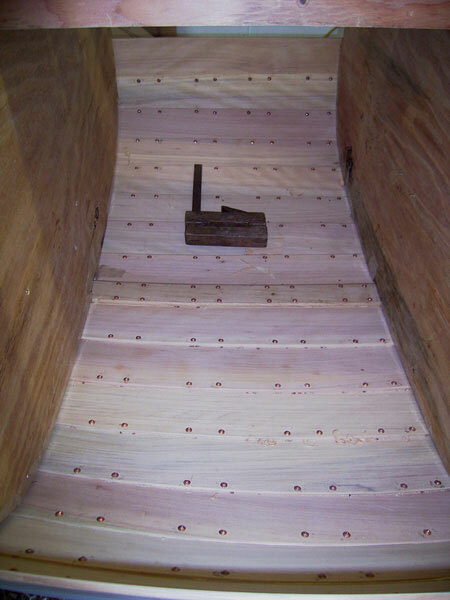 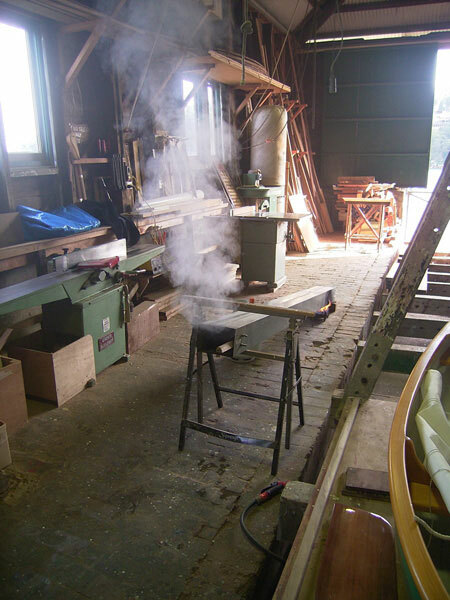 Once dry, the building jig which had been used for the prototype dinghy COOEE, was dusted off and a backbone and transom set up. 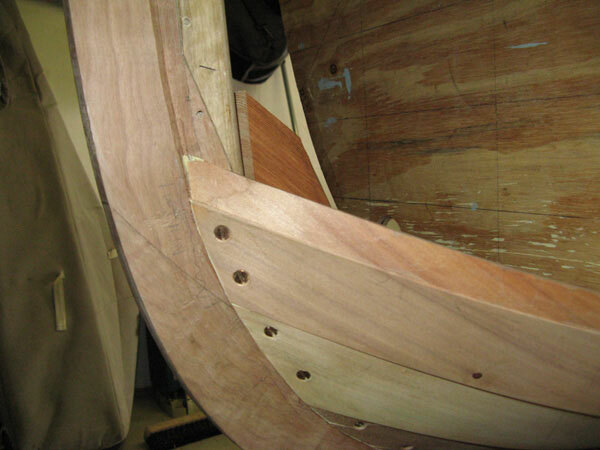 Unfortunately at this stage the pressures of running a small business were compounded with the pressure of another major job – the restoration of the 42 foot 30 Square Metre yacht LAROOL. 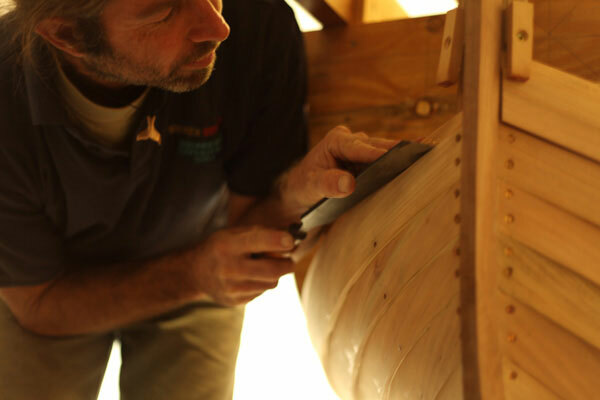 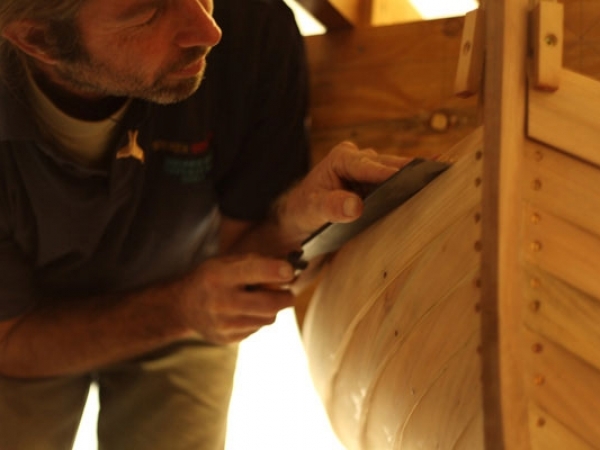 Friend and skilled shipwright Mikey Floyd was called in to plank and frame the hull. 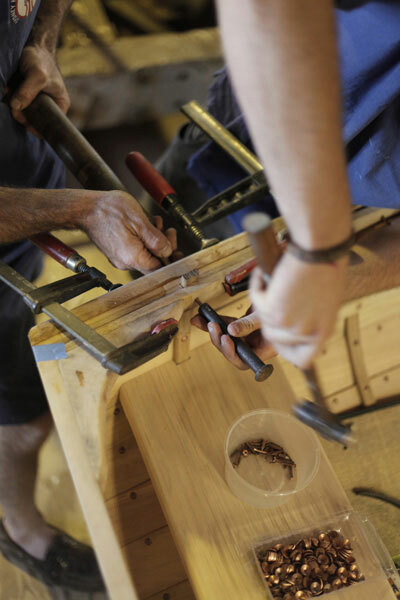 Simons apprentice Hywel Turner was assisting Mikey with some of this work. 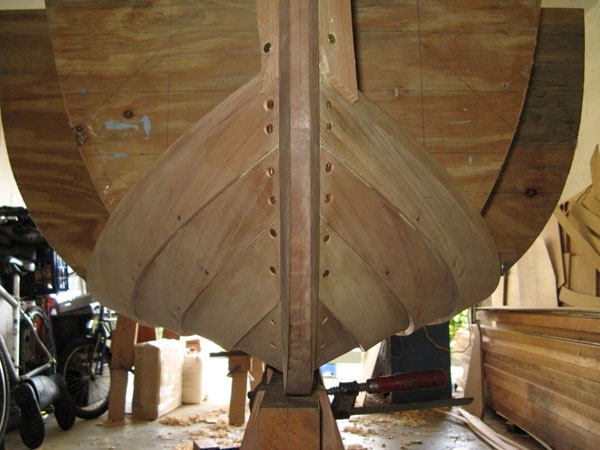 The planked and framed hull was finished just in time for the exhibition. 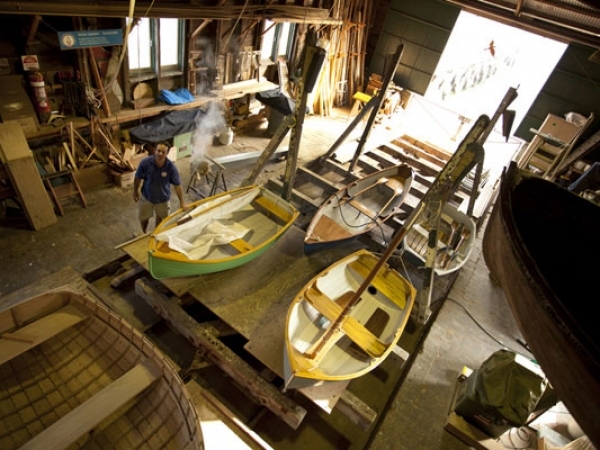 The exhibition was a trove of kauri objects ranging from furniture to musical instruments to jewellery to a clinker dinghy! 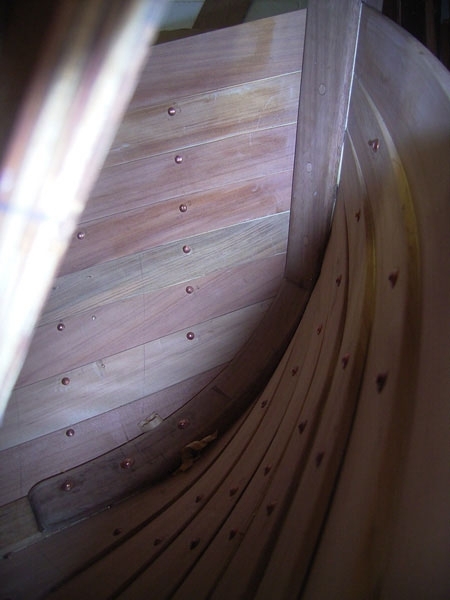 The dinghy was sold to philanthropist Doug Jackson who customised the finish to his requirements. 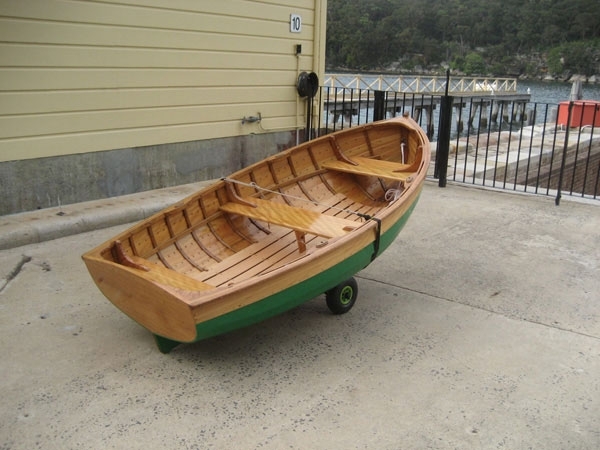 After the exhibition the dinghy was taken back to the Chowder Bay Boatshed. Gunwales, inwales and thwarts were fitted. 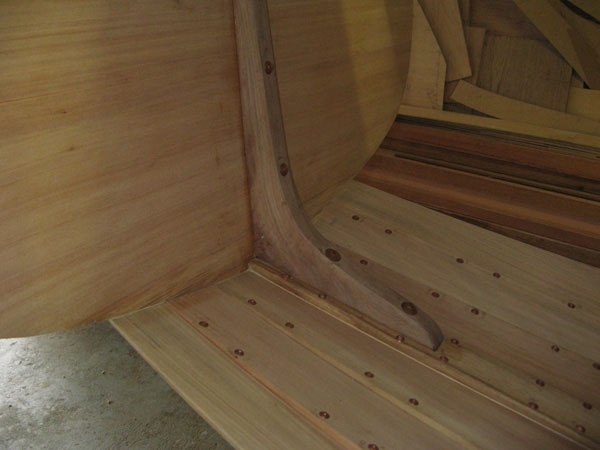 White Beech Sole boards were made up, breasthook, quarter knees and thwart knees were added in grown tea tree. 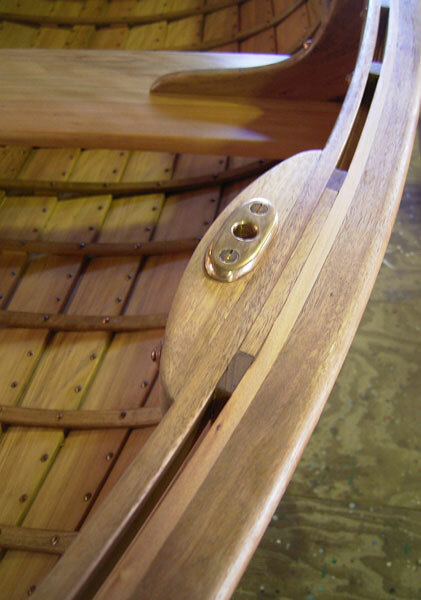 A set of beautiful Oregon spoon blade oars were made up by ex Sargent and Burton shipwright James Nash. 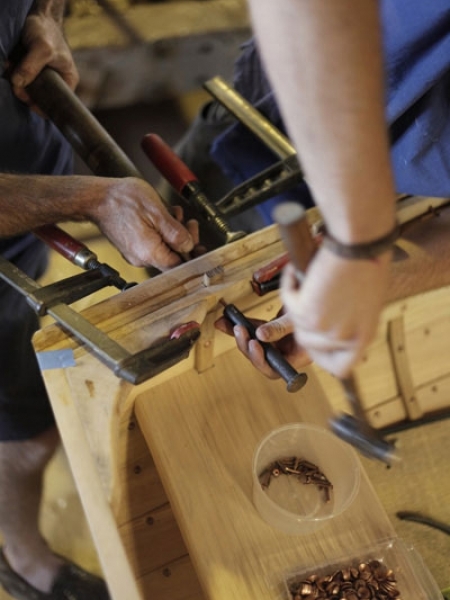 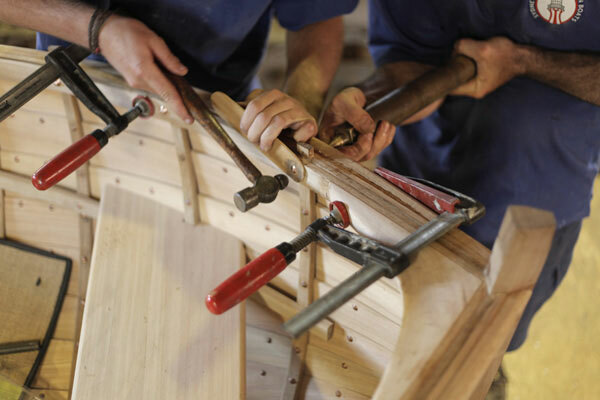 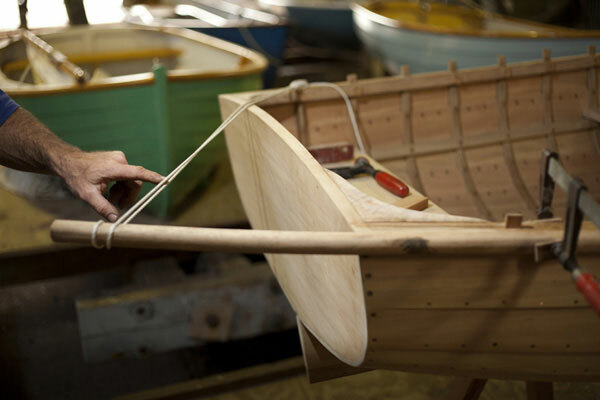 Our apprentices leathered the oars, and a set of Rick Wood bronze racing rowlocks were fitted. 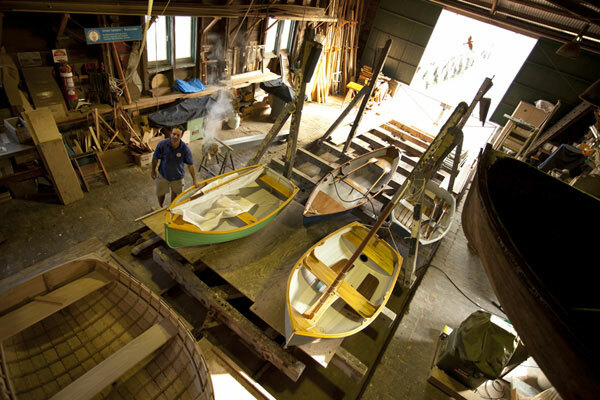 Doug named the dinghy TIMMO after his wife Tim Jackson. 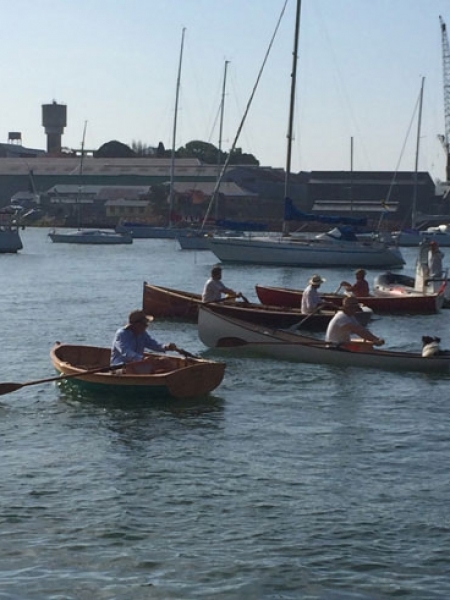 TIMMO is a regular entry in the annual Balmain Regatta Rowing Race. 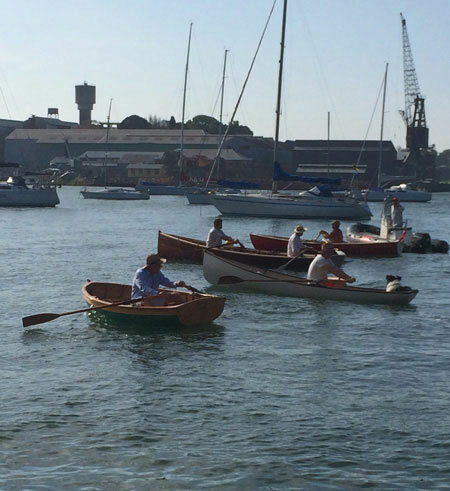 She is often the smallest boat competing but always puts in a great performance.  Doug uses the TIMMO to explore the harbour around Balmain. 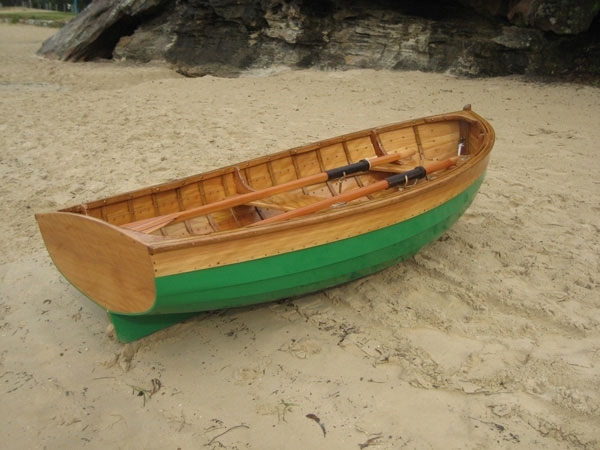 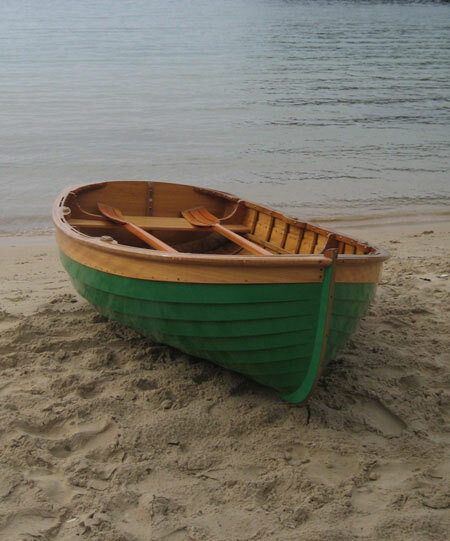 She is a pure and simple rowing dinghy.